If you think you can't dance, stop right there! Learning to dance is a skill like any other and simply requires good, step by step instruction. Lucky for you today you can learn 3 Club dance moves for guys with 3 FREE beginner video tutorials (below). 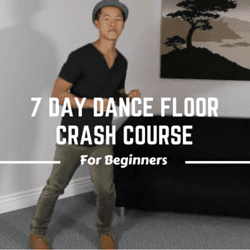 These free easy dance moves come from the 7 day dance floor crash course. You can use these steps at any party, club and social occasion. In order to look good on the dance floor you need to learn steps that are simple and look natural and these moves are perfect. The following moves are very easy for anyone to learn and use right away. Learn how to dance easily with moves that you can use at clubs, parties and weddings. This course is perfect for absolute beginners who want to look "natural" on the dance floor. This video course has 7 modules with +3 hours of video instruction. Delivered through instant downloads. This dance move combines "sway" and "bounce". You will learn how to incorporate these 2 basic moves together to make it look very natural and groovy. Perfect for low key grooving at clubs. Easy Dance Move #3: How to approach girls and not get rejected! This is a fun easy move that you can combine with the moves you learned above. Here you will learn how to do a walk with style. The key here is to play with the angles of your body, using your arms and flexing and bending your knees.